Sinŭiju (Shinŭiju-si) is a Korean gateway city neighboring with Dandong, China across the Amnok River (Yalu river). 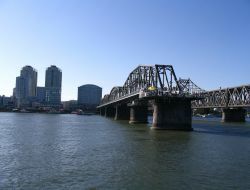 The city is linked with Dandong by a railroad bridge. 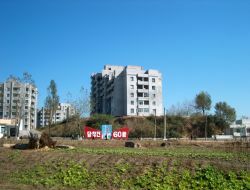 Sinuiju is the capital of North Pyeongan Province. 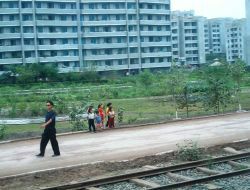 It is located 28 km west of Ŭiju, the old city from whose name Sinŭiju (meaning “New Ŭiju”) derives. 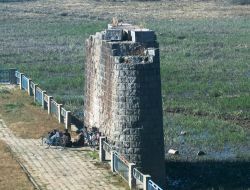 Sinuiju was developed as a major settlement during the Japanese colonial rule at the terminus of a railway bridge across the Amnok River. 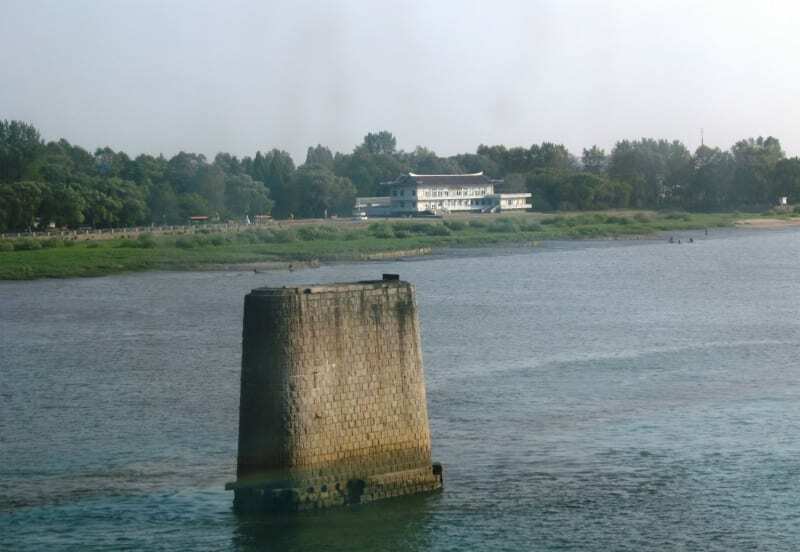 As an open port, it grew commercially with the logging industry which uses the Amnok River to transport lumber. 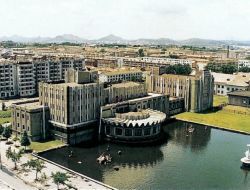 Additionally, a chemical industry developed after the hydroelectric Sup'ung Dam was built further up the river. 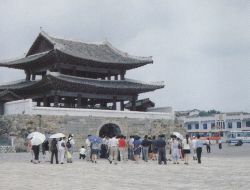 In the course of the Korean War, the city sustained heavy damage from aerial bombardment as part of the U.S. Air Force strategic bombing of North Korea, but the city has since been rebuilt. Because of its strategic location between China and Korea, the Amnok river was the site of battles during the Sino-Japanese War (1894-1895) and the Russo-Japanese War (1904-1905). 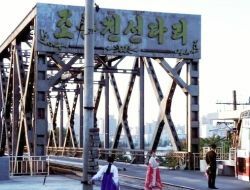 The Korean side of the river was heavily industrialized during the the Japanese colonial period (1910-1945) and by 1945 almost 20% of Japan's total industrial output originated in Korea. 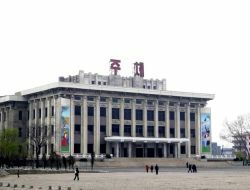 An important light industry center in North Korea, Sinuiju has a plant manufacturing ironware and other industrial goods. 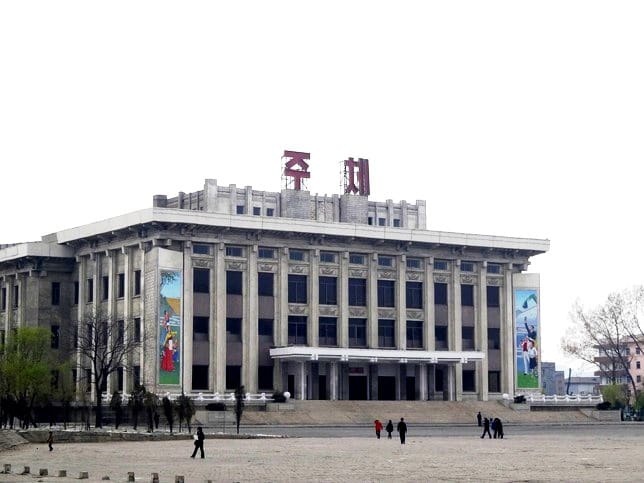 Much of North Korea's trade with China takes place through Sinuiju. Its southwest harbour has a shipyard. 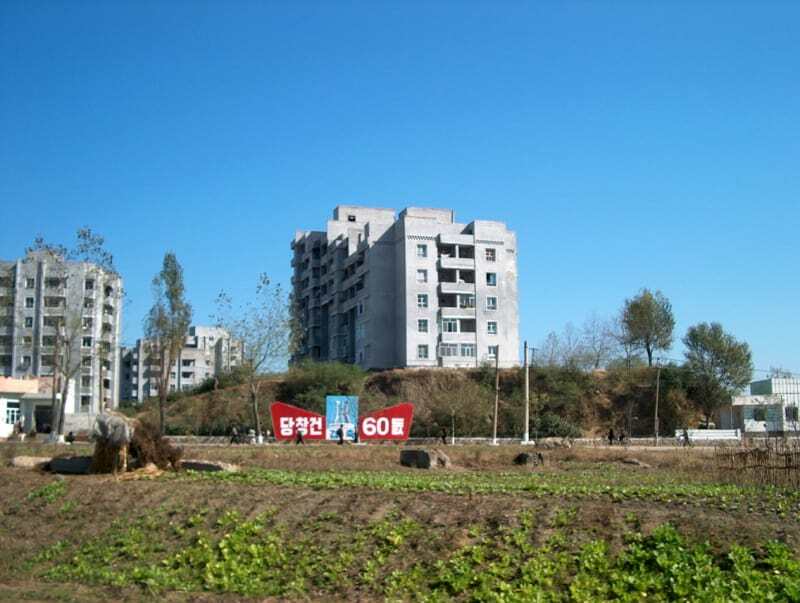 Part of Sinuiju is included in the Sinŭiju Special Administrative Region, which was established in 2002 to experiment with introducing a market economy. The DPRK government announced plans to develop Sinuiju as an "international financial, trade, commercial, and industrial" zone along the lines of China's Special Economic Zones. 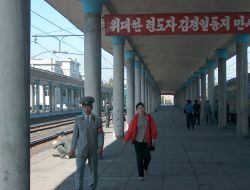 From Pyongyang: Sinuiju is 230 km away from Pyongyang. 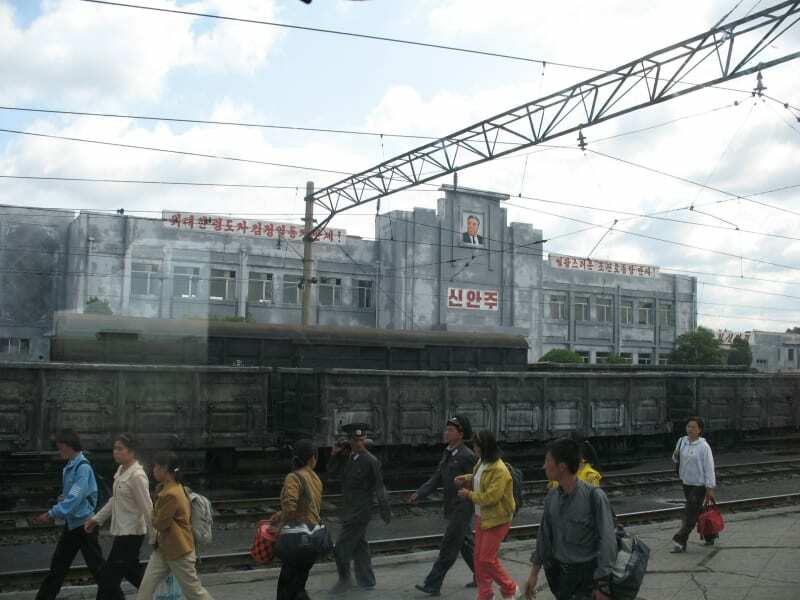 Sinuiju can be reached from Pyongyang by railway - there is a daily train from Pyongyang. 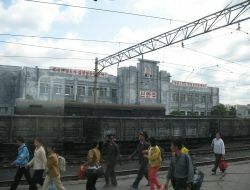 Sinuiju Station is the northern terminus of the Pyongui Line railway from Pyongyang. 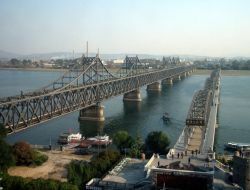 It is also connected with the Chinese city of Dandong (renamed from Andong) in Liaoning Province (China) by the Sino-Korean Friendship Bridge. From Dandong: Various tour boat operators in Dandong offer Amnok River tours along Friendship Bridge for 20-50 RMB charge. 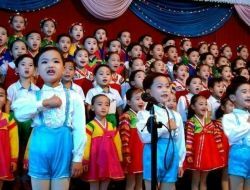 Chinese, Korean, Japanese and other nationalities venture across the Chinese half of the river from Dandong for a ten-minute cruise paralleling Sinuiju for a close-up glimpse into North Korea. 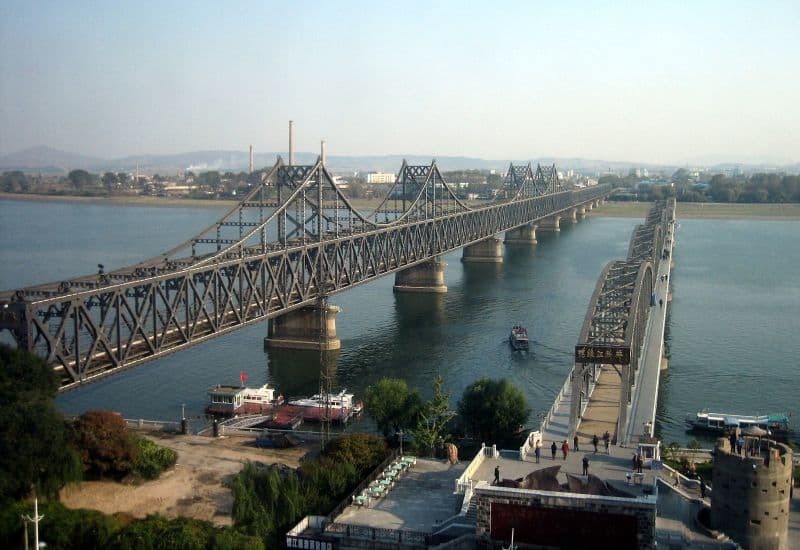 It is possible to get from Sinuiju to Dandong (China) by bus over Sino-Korean Friendship bridge. Then in Dandong it is possible to take ferry to Incheon (South Korea). 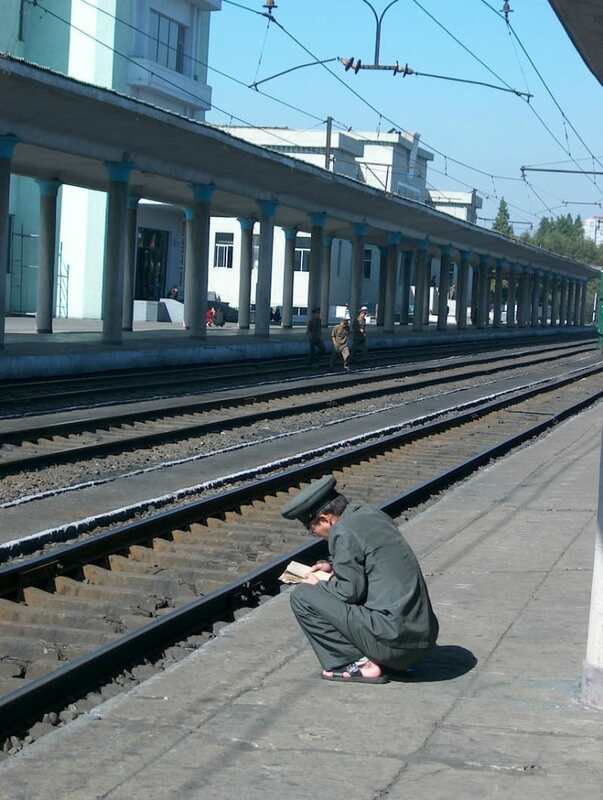 Travel time between Dandong and Incheon is 16 hours. 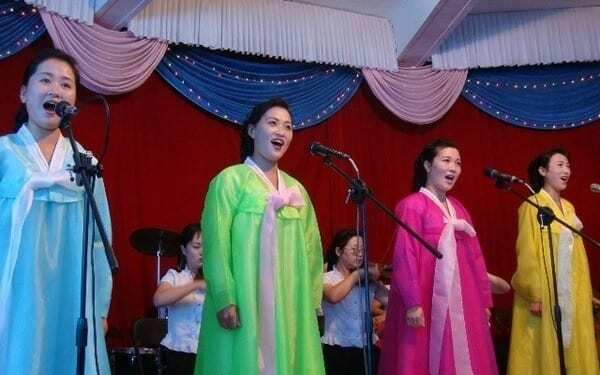 Since recently Korea Konsult has been offering an amazing opportunity to visit North Korea for a short while during the weekends - enter Korea over Sino-Korean Friendship bridge connecting Dandong city in China and Uiju city in North Korea. The Sino-Korean Friendship Bridge (built in 1943) and the half-destroyed Amnok River Bridge (built in 1911) sit side by side on the Amnok River. 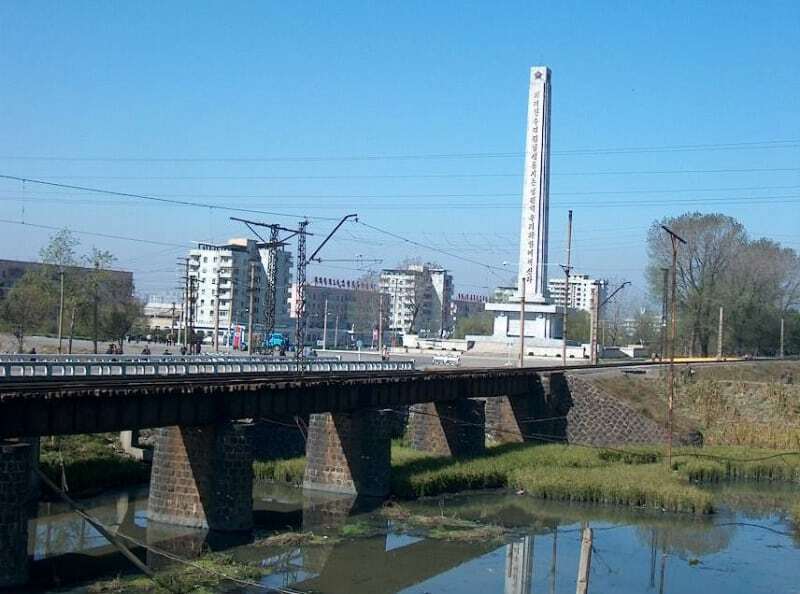 The Sino-Korean Friendship Bridge connects China (Dandong city) and Korea (Sinuiju city), it is 944 m long (3,097 feet) from end to end, and through the Manchuria Railway links up with the Trans-Siberian railway. 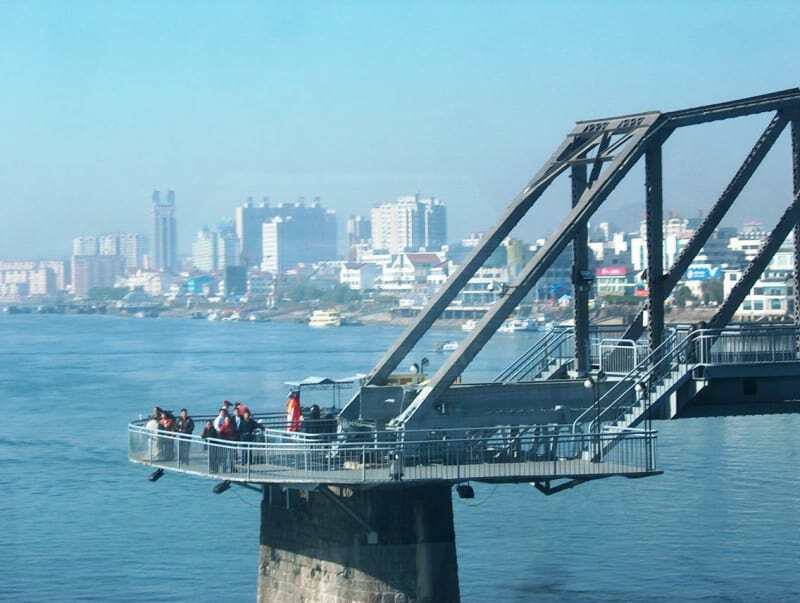 Three border bridges once crossed the lower reaches of the river. 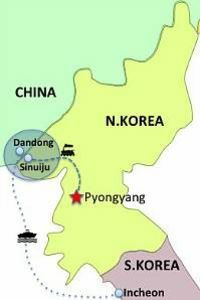 During the Korean War 1950-1953 UN troops approached the river and provoked Chinese intervention from around Dandong. U.S.General Douglas MacArthur ordered B-29 bombers along the Amnok River to focus on the area surrounding the Sinuiju Bridge in order to disrupt the flow of troops and material from Manchuria into North Korea, and here Chinese MIGs and U.S.jets escorting the bombers engaged in history's first jet-to-jet combat. 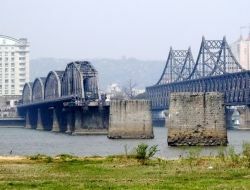 American forces destroyed two bridges across the river except Sino-Korean Friendship Bridge connecting Sinuiju and Dandong. 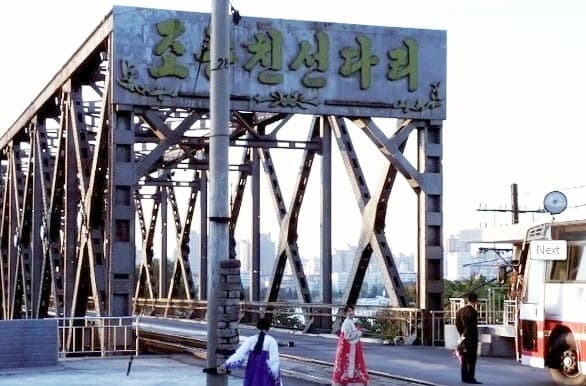 The Friendship Bridge survived the bombing and today is used as one of the very few points of entry into North Korea from China for rail, road, and pedestrain traffic. 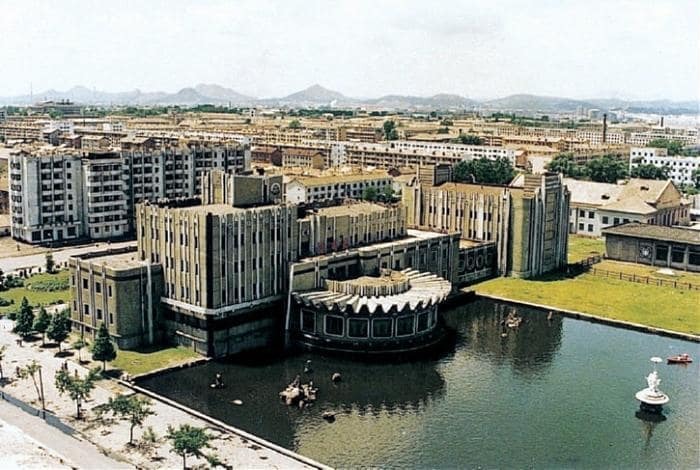 It was constructed by the Imperial Japanese Army between April 1937 and May 1943, during their occupation of Korea and Manchukuo, to span the Amnok River. 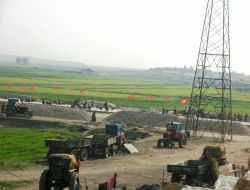 The bridges were repeatedly repaired. 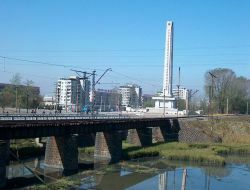 The 1911 bridge was left destroyed and only the newer 1943 bridge repaired and used at the end of the war. 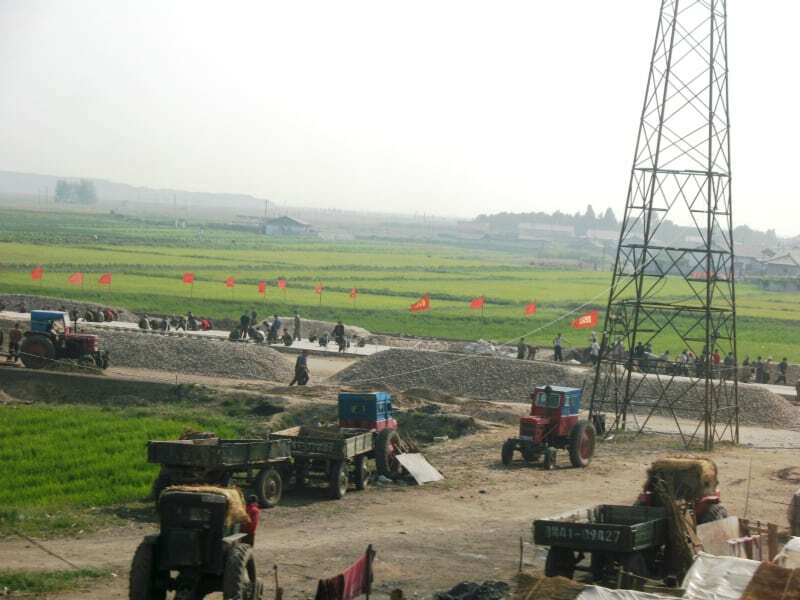 Chinese rebuilt their part of the Amnok River bridge but the North Koreans claimed that they did not want to rebuild their part so that the United States could not deny they destroyed it. 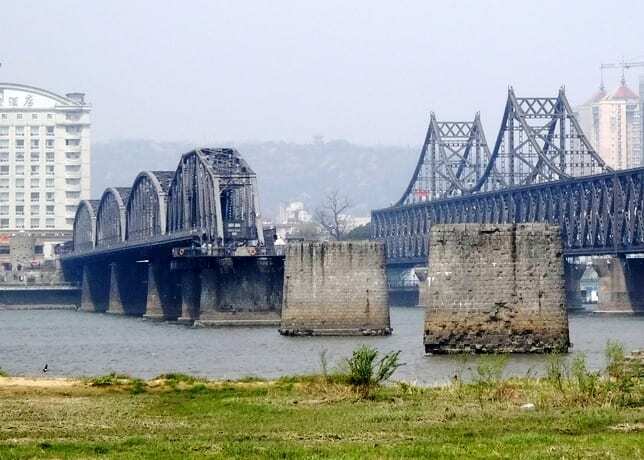 Four spans of the old bridge remained on the Chinese side of the river, giving it the name the "Broken Bridge"
Sinuiju which was a backward city before liberation from Japanese rule in 1945 has developed into a modern industrial city. 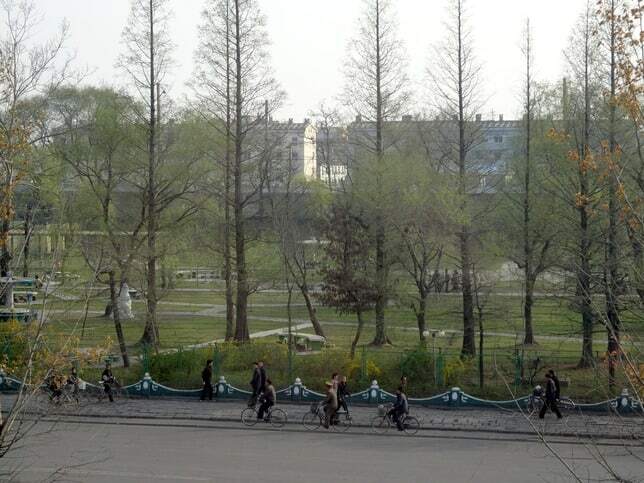 There are several attractions in the city centered around central square of Sinuiju featuring the giant statue of President Kim Il Sung: Tonggun Pavilion, Waterfall, Hot Springs and Ferris Wheel overlooking the Amnok River. 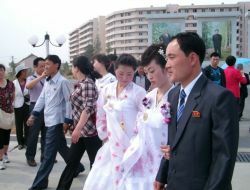 It stands in the centre of Sinuiju. 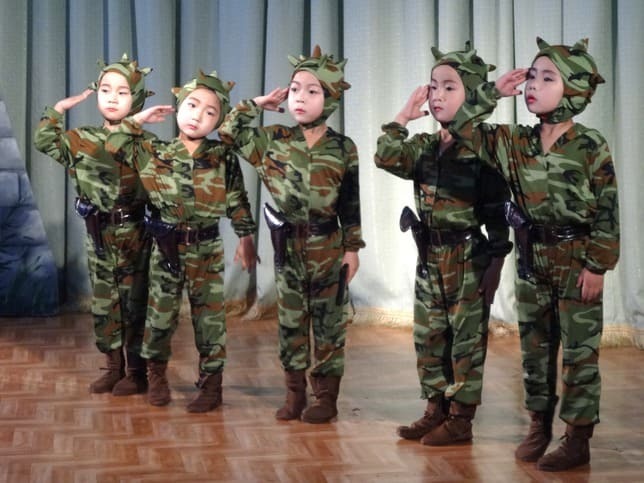 The museum exhibits the materials related to on-the-spot guidances of President Kim Il Sung and General Kim Jong Il. 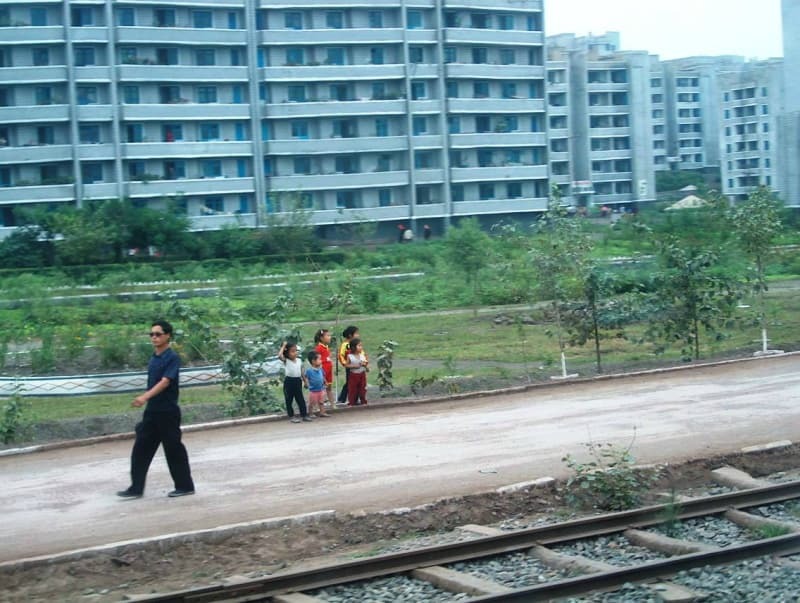 The total floor space of the 2 storey building is 10,000 square meters. 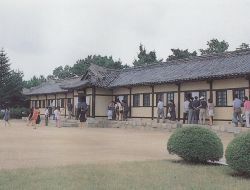 It is a provincial museum located at Sinwon-dong in Sinuiju. 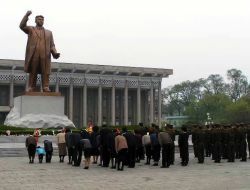 Founded on November 30, Juche 36 (1947), it displays historical relics and materials from the primitive community to the modern age centering on those excavated at the province. 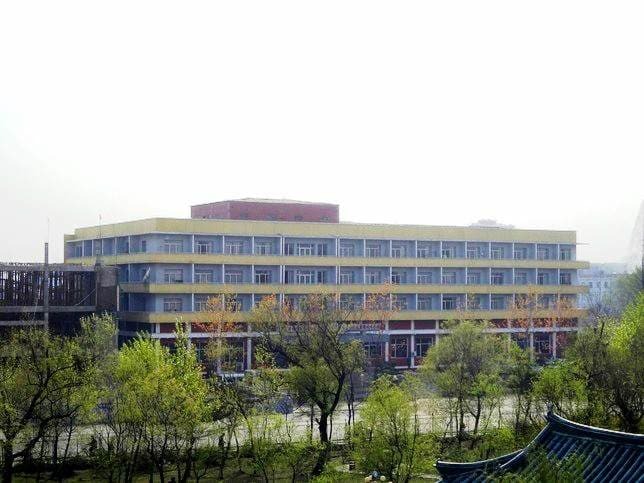 The cosmetics factory makes all kind of products from ginseng toothpaste to washing powder. 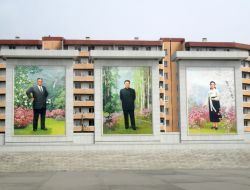 It is an art-producing centre founded in November Juche 57 (1968). Professional artists and creators work here. 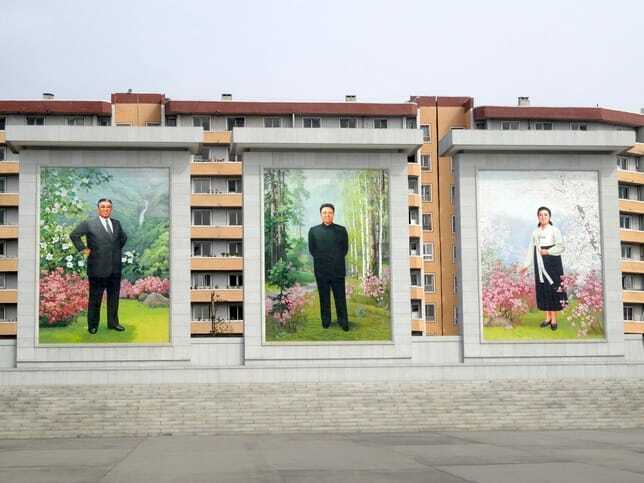 There are over 250 pieces of DPRK fine arts in six large halls including paintings of Kim Il Sung, Kim Jong Il and Mother Kim Jong Suk going about their daily duties. As a souvenir you can get a sketch of yourself for 20RMB. 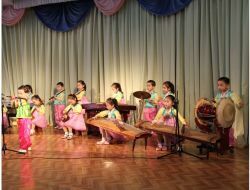 Situated in Ponbu-dong the kindergarten accomodates more than 500 children. 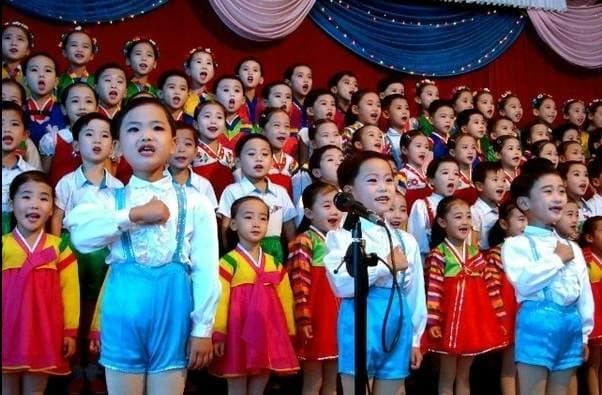 It was open in Juche 77 (1988) and is famous for training the children who perform in the Arirang Mass games. The children performance in the kindergarten is the best of any Kindergarten in the country. 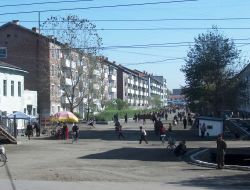 Uiju is 28 km up from Sinuiju along the Amnok River. 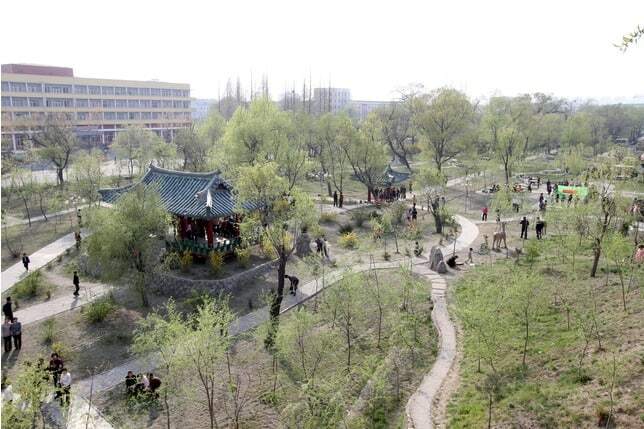 It has many relics of Koryo and Li dynasties (Uiju South Gate, Thonggun Pavilion), several picturesque parks, pleasure grounds and well-arranged historical places associated with the struggle of Kim Hyong Jik. 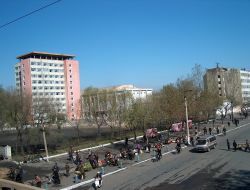 Uiju was the capital of North Phyingan Province until Juche 12 (1923). It stands in the heart of Uiju Town. 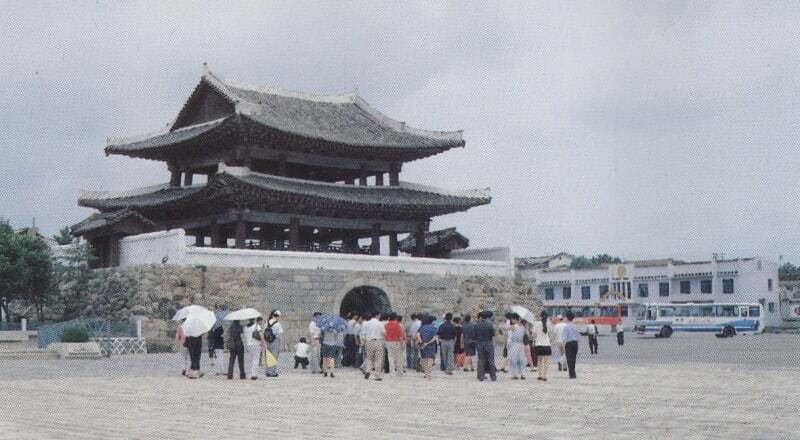 In 1613 under Li dynasty the gate was rebuilt as a part of Uiju wall reconstruction efforts. 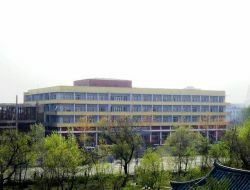 The museum is located in the building which used to be Yangsil Boys School. It exhibits materials on the revolutionary activities conducted by the anti-Japanese fighter Kim Hyong Jik from Juche 1 (1912) to Juche (1921). 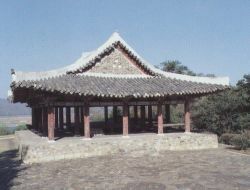 A pavilion built during the Koryo dynasty, it is in the top of Mt.Samgak overlooking the Amnok River. 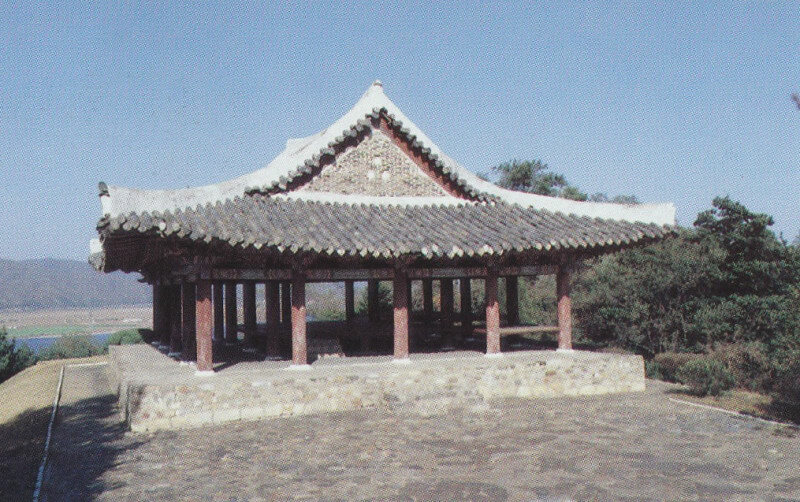 The pavilion first built in 1117 was used as the northern commanding post of the Uiju Wall, during Koryo and Li dynasties. 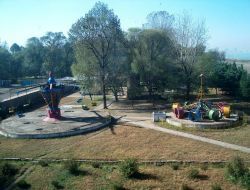 Around pavilion there are several other attractions: a pleasure ground, sexangular observatory and Rakwon Pavilion. 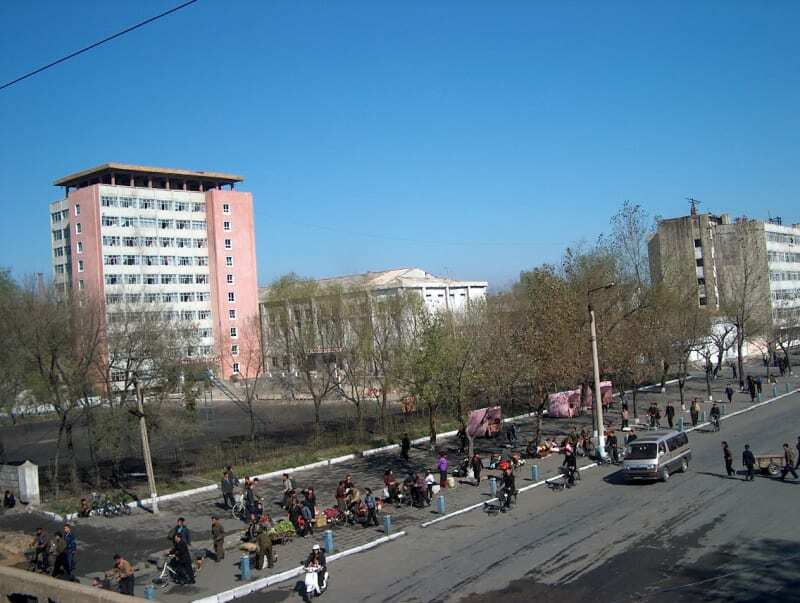 Tongrim is a town in coastal southwestern North Pyongan province. 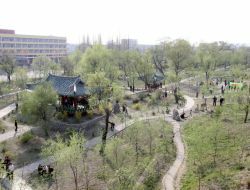 Noted landmarks include Tongrim Falls, a 10-meter waterfall, and the Tongrim Manchurian Ash, which is North Korean natural monument No. 11. 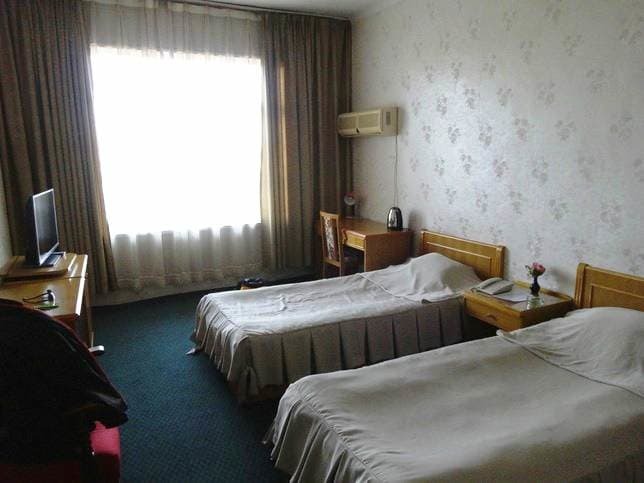 Tourists often come to Tongrim to stay overnight in well-maintained Tongrim hotel. It is possible to append adventure in Sinuiju to any group or individual tour. 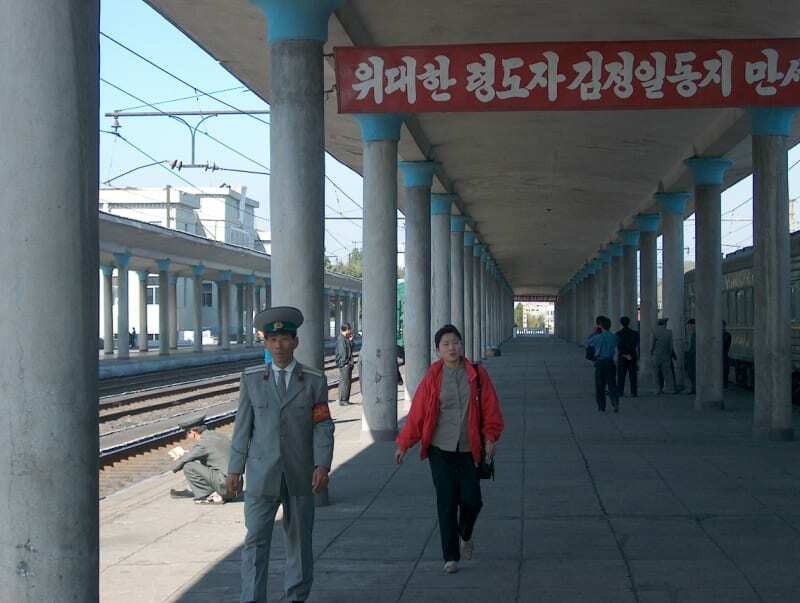 The standard way is to take train from Pyongyang to Sinuiju, enjoy Sinuiju, take bus and cross Sino-Korean bridge from Korea to China and continue further by train to Beijing. Day 1. 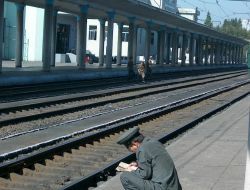 Take train from Pyongyang at 10.40 in the morning and arrive in Sinuiju at 15.45. 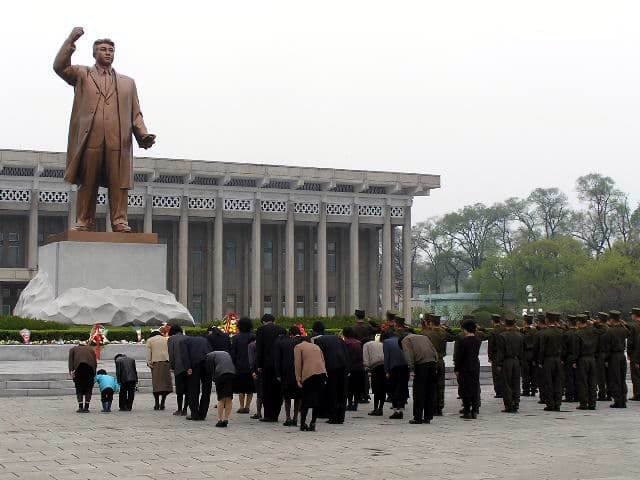 Enjoy sightseeing Central Square and stop by Revolutionary Museum of North Pyongan Province. 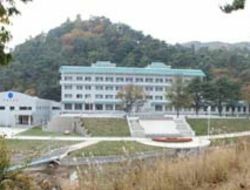 Drive to Ryongchon and visit Ryongchon Sinamri Cooperative Farm and then move to Tongrim County and see Tongrim Waterfall. 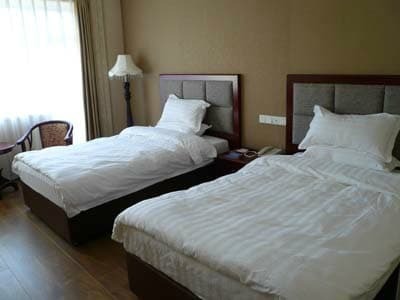 Check in & Overnight at Tongrim Hotel. Day 2. 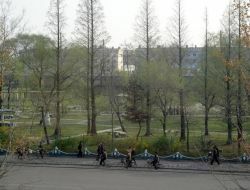 Breakfast and drive back to Sinuiju and visit Cosmetics Factory. Continue to Folk Park, and expect Sinuiju History Museum, and then enjoy Lunch at Tourism Restaurant. 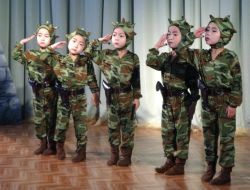 Visit Fine Art Studio, and experience children performance in Ponbu Kindergarten. Cross by bus the border bridge to Dandong in China, where you either take the train back to Beijing (departs at 18:30) or stay in Dandong. 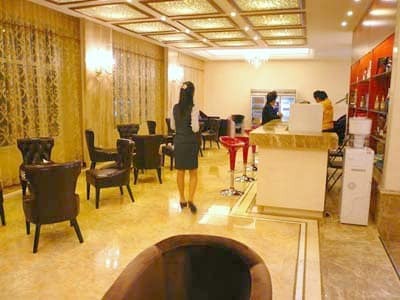 Tongrim Hotel - located in Tongrim town, this Deluxe hotel is about 1h drive from Sinuiju. It was open in November 2014. 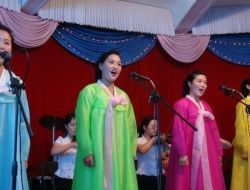 During the tour there will be several opportunities for shopping: cosmetics, cigarettes, candies, traditional clothing and beer, traditional Korean alcohols. There doesn't seem to be much of export restrictions for foreign tourists. All prices are are quoted in Chinese RMB, only cash payment is accepted. RMB is the most preferred currency.